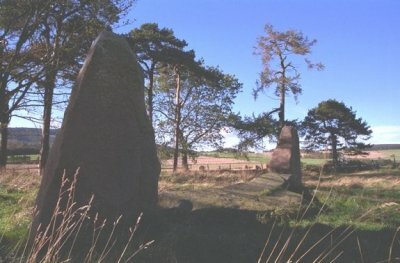 Sunhoney is one of the biggest, oldest (third millennium BC) and best preserved stone circles in Aberdeenshire. Go down the B9119 Aberdeen/Ballater road to Sunhoney Farm 1½ miles west of Echt (buses run to Echt and Midmar from Aberdeen). Ask permission at the farm to go up to the circle which is visible among trees behind the farm and across a field. It is overlooked by the superb heather-covered ramparts of the Barmekin hillfort of Echt. Maybe there is something in a name. Sunhoney, or its old name Seanhinny does sound better than some Aberdeenshire place-names like Wicketslap and Brownhill of Brokenmoan! This beautiful circle has 11 tall red granite stones still standing. 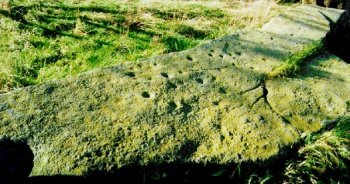 The fallen, broken recumbent stone is clearly decorated with dozens of cup-marks; ancient star chart, lunar positions, map of water sources - nobody knows. The circle is set out on a truly circular plan, later ones being more ovoid, the stones being linked by a bank. In the central ringcairn cremated bone was found and fragments of a stone pot was found in a cist at the edge of the cairn.